What a wonderful little camera. 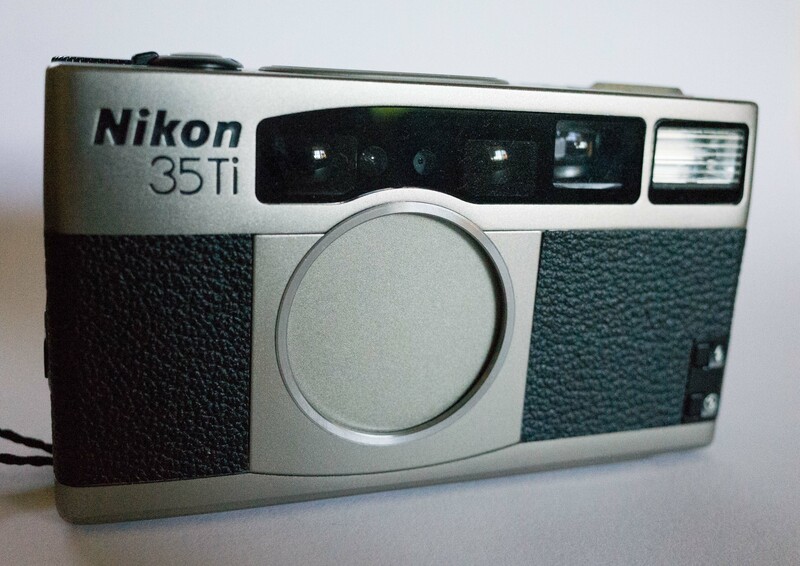 The Nikon 35ti was made from 1993 – 1999, the period of the “Great Resistance” – a time when the film companies thought everything was still going to be OK.
Nikon mostly did not skimp on anything with this little beauty. 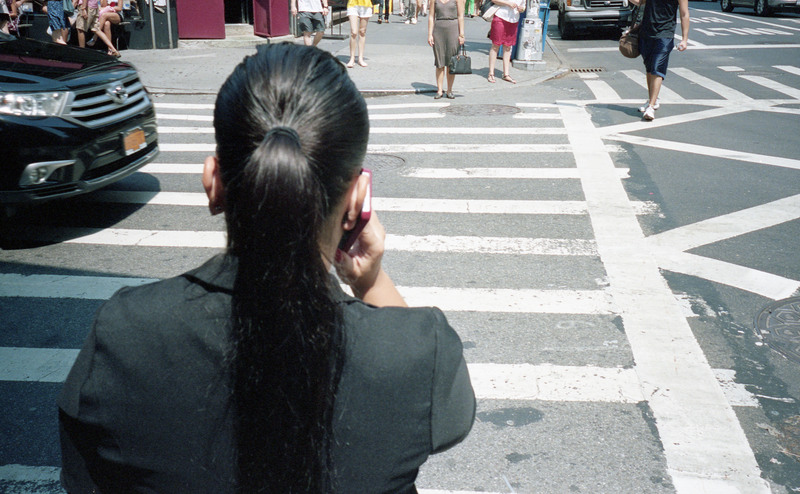 35mm is a nice focal length for street photography. A sort of “inbetween” that works in most situations. Not that wide that you struggle to focus in on a subject, but still get plenty of the scene into shot. A lot of peeps prefer a 28mm lens on their compacts – I just find that a little wide most of the time. Close focus is 40cm – not too bad. Nikon put a full on Matrix Metering system which enables the camera to handle challenging light conditions easily. I am surprised how few under / over exposed shots come through this camera. Combined with the nice wide F2.8 and built in flash, there are not too many situations which it won’t keep up with. The DX code reader will allow for films from ISO 25 – 5000, although I am not sure where you will find an ISO 25 film these days? The 35Ti flash in action. 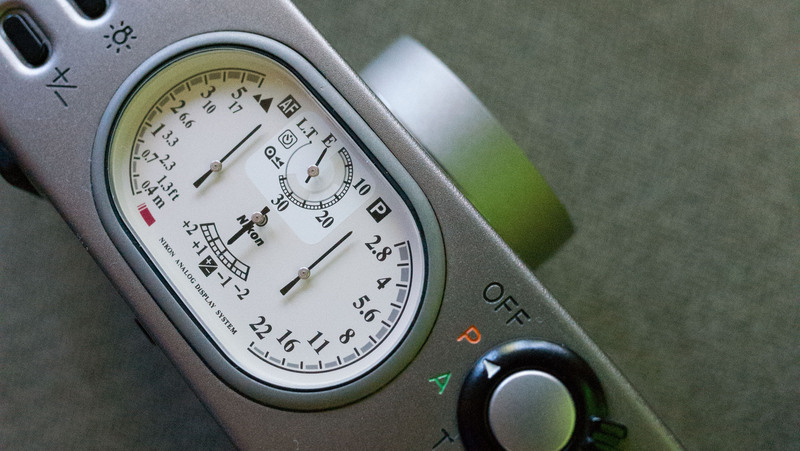 Shutter speeds are OK for compact – 1/500 to 2secs, and up to ten minutes on manual exposure. The 1/500 can be a little on the slow side for bright sunny days. Just something to keep in mind, especially with ISO 400 film loaded up. There is no way to set ISO manually which is not a massive hassle, but still makes it hard if you want to push a film. You can always find a way around automatic functions – there is a whole web page dedicated to it here. Focus is OK – it is pretty accurate, but can be a little slow as the focus motor winds backwards and forwards. There is only one single centrally placed focus spot. 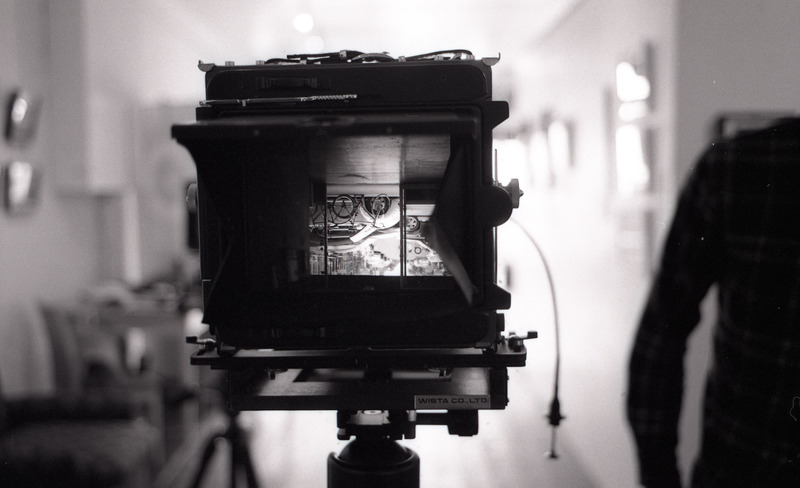 The viewfinder is a little confusing at times – it is fairly busy. The panoramic framelines are #2 – although they also have additional parallax correction #7 frame lines that pop up when required. 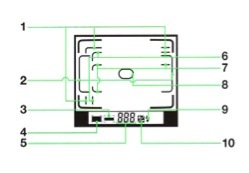 To be fair, only the relevant framelines appear in the viewfinder, as required – so the frame doesn’t look quite so cluttered as the illustration. 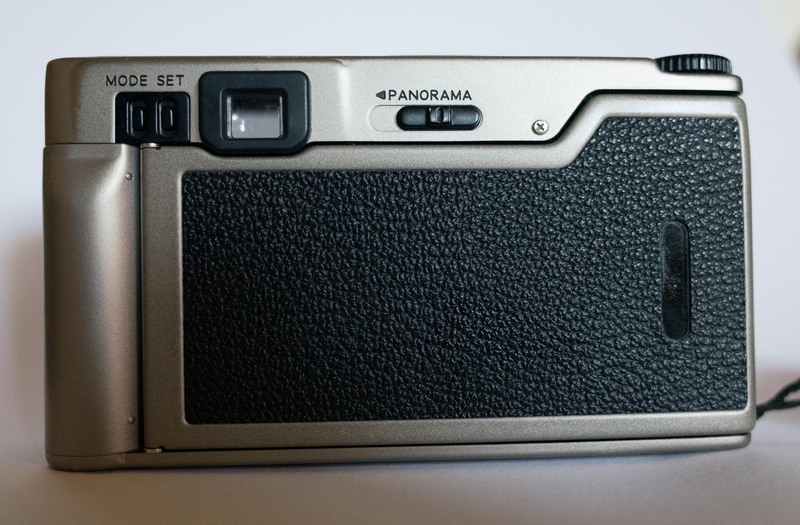 Still, a cheap way to explore panoramic format photography without shelling out for an Xpan. The little on camera flash is pretty good and well controlled by the camera. The fill flash is particularly good. One of the camera’s quirks is that the only way to completely cancel the flash is to hold the right button down when exposing. 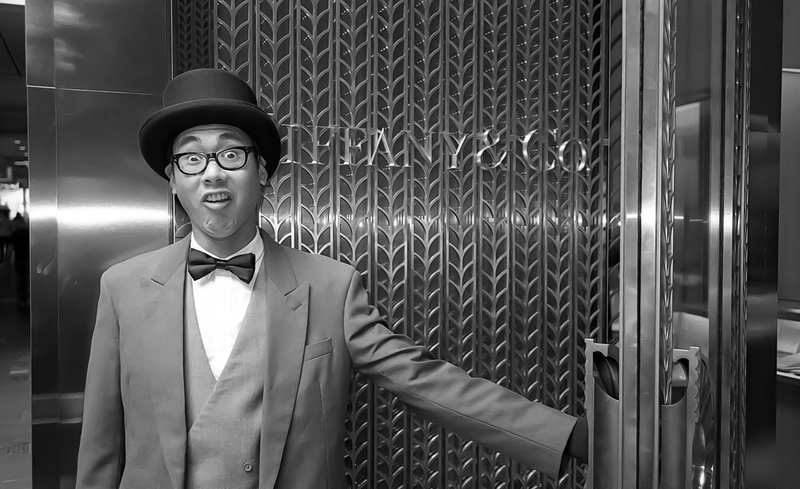 A bit of a hassle… and unpredictable. The flash symbol does come up in the viewfinder, but it is still not ideal. Maybe I just haven’t worked it out yet? The camera works in 3 exposure modes. P – Program Mode : Automatically selects the most appropriate shutter and aperture combination. The manual claims there is a way to change the combo, but I have not successfully been able to work out how to do this. I usually leave the camera in P mode most of the time and hope the camera makes a good choice! Super awesome handling of the light conditions and accurate, sharp focus in P mode. A – Aperture Priority Mode : User selects the aperture and the camera does the rest. Whilst this is the mode I mostly use in other cameras, the 35Ti just doesn’t do it for me. There is no aperture reading in the viewfinder and the command dial is not in the best ergonomic position for adjusting whilst shooting. I can’t always work out which way is opening up the aperture and often miss the shot opportunity but the time I get the exposure right in this mode. T – Long Time Exposure Mode : Haven’t used it. All the main readings are laid out in a suitably awesome analogue dial on the top of the camera body. Shutter speed, aperture, shots remaining, and exposure compensation. It really does look aesthetically incredible, but is also next to useless. The information it displays is what I need to see in the viewfinder – it would only make sense if they had a waist level viewfinder? Close focus with parallax correction. Aaaah, don’t take it too seriously. The analogue dials are what attracted me to the camera in the first place. They are very pretty. And like most pretty things, not always useful. The body is made from titanium, apparently, and pretty tough. It is tough and light enough to comfortably leave hanging around your neck for a few hours at a time. The body is a little wider than it probably needs to be. There is only one connection point for as strap. The only other “watchout” is the film back release lever. It is very plastic and very breakable. Just got to be careful with it. A bit disappointing when the rest of the body is tough. 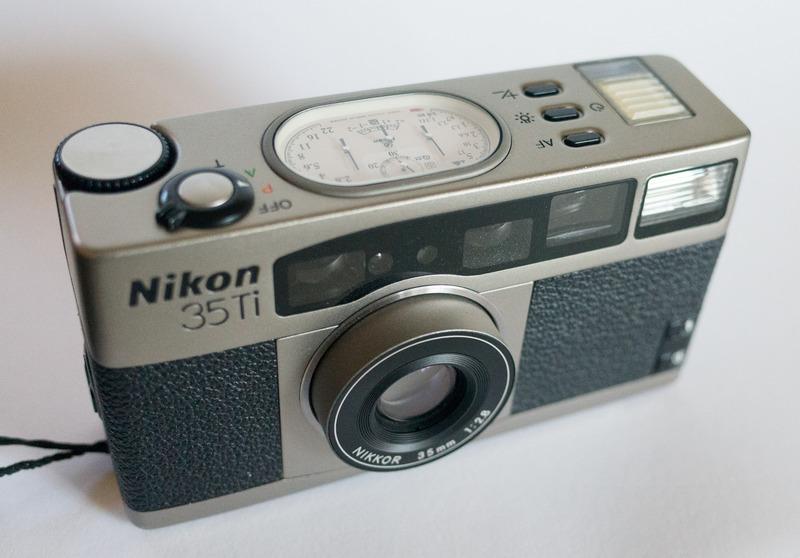 The Nikon 35Ti is a great little camera, but tends to quirkiness. The lens is simply fantastic and combined with the matrix meter produces excellent images. The focus is a bit on the slow side, and, of course, the motor is going to burn out someday and not be repairable. Re-reading the review, I realise it sounds a bit negative. It is easier to pick on stuff that to pump it up sometimes. Overall, I love this little camera. Nikon 35Ti cameras are not as highly sought after as some of it’s contemporaries such as the Ricoh GR, Contax T3, and Leica Minilux. Prices are usually OK on ebay and other sites. You should be able to pick one up for well under $AU350 if you are patient. If you like the look of the camera, and have been hankering for a compact 35mm, it is pretty good value for money.